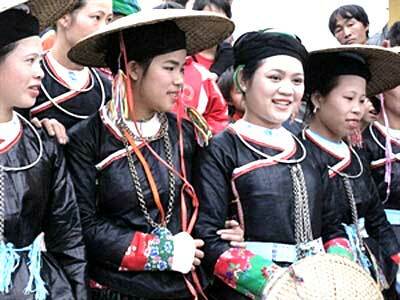 A c ultural event highlighting the Khau Vai Love Market will take place on April 24 to 26 in the northern Ha Giang province’s Meo Vac district, according to a local official. “The Khau Vai Love Market festival 2014 will be organised on a large scale with activities taking place for three days showcasing the most typical cultural features of the local ethnic minority people,” vice chairman of the provincial People’s Committee Tran Kim Ngoc said. The 100-year-old festival, which is held annually during the third lunar month, is a popular meeting place for ethnic groups, and particularly for those people in love. Legend has it that a couple who very much loved each other, but could not live together, made the promise to meet once a year in Khau Vai on the 27th of the third lunar month. From then on, the festival has been held every year on this day for ex-lovers to meet and share their feelings. “Festival goers will have the chance to enjoy horse fighting, which is available nowhere else, as well as bull and nightingale fighting,” Ngoc added. The event will also present cultural and art performances, and folk games, including drum dancing of the Giay ethnic group, linen weaving, flute making and horse riding with the Mong people. Other activities will include tasting traditional dishes such as maize wine, mint-fragrant honey, smoked pork, goat hot pot, and wearing the costumes of the ethnic girls and women.